You may have seen Google’s homepage Doodle today, commemorating the 66th anniversary of the discovery of unidentified wreckage on a ranch near Roswell, NM. To aid in these commemorative activities of the Roswell events, we at the AHC would like to highlight one of our UFO-related collections, the R. Leo Sprinkle papers. 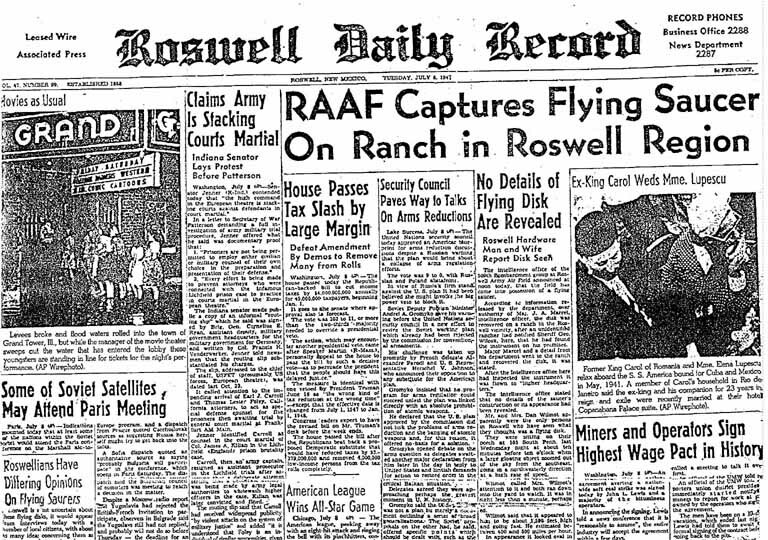 The “Roswell Daily Record” from July 9th, 1947, announcing the discovery of wreckage near Roswell, NM. Ronald Leo Sprinkle was born in Rocky Ford, Colorado, in 1930. Receiving his PhD in Counseling Psychology from the University of Missouri in 1961, he held the position of Assistant Professor of Psychology at the University of North Dakota from 1961 to 1964. He then was hired at the University of Wyoming and served as Associate Professor of Guidance Education, Counselor and Assistant Professor of Psychology, Director of Counseling and Testing, Professor of Counseling Services, and Counseling Psychologist. Sprinkle’s major professional interests were counseling and hypnosis, the psychological aspects of UFO research, and parapsychology. In his career, he published extensively on UFOs, served as a consultant for several T.V. programs, and founded the Rocky Mountain Conference on UFO Investigation. He corresponded with many ufologists and abductees, including Ida Kannenberg. Sprinkle resigned in 1989 to become a professor emeritus and a counseling psychologist in private practice. This collection contains the personal and professional correspondence of Leo Sprinkle as well as articles and manuscripts by other authors, an extensive collection of paranormal-related newsletters, Sprinkle’s own published papers, and his original research. Most materials are about UFOs and the psychology of UFO contactees. Other subjects include conventional psychology, paranormal activity, multiple personality disorder, parapsychology, reincarnation, and near-death experiences. Regardless of how interested in the discovery of UFOs and alien life forms–whether you live and breathe according to each new extraterrestrial discovery or theory, or happened to watch The X-Files once–the Sprinkle papers have something to interest you! This entry was posted in popular culture and tagged On this day in history. Bookmark the permalink.